Tricky Trio slot brings us all the fun of the magician's show and the first thing I noticed is the stage-show type music blasting out at me when opening the game up and my headache wasn't improved when realizing it keeps up throughout the spins too and then even adds a loud 'THUD' as the reels stop. After rapidly muting this I can tell you the game is set between the curtains of a theatre stage and the reels have the background of the magician's concealment sheet with all the symbols you'd expect of the theme. There are far more aesthetically appealing magic-themed slots than this one, such as WMS' Magic Wand or Microgaming's Magic Boxes but if these magicians can wave their wands over our bankroll, will that really matter in the end? Merkur give us 20 paying lines on Tricky Trio slot and there are stacked symbols here except for the scatters and Wilds. The 5-of-a-kind pays begin with the Wild chests at 100x bet but oddly even though they appear on all 5 reels, according to the pay tables they only pay this in one of the features! So this means in the base game they must either not be possible on one line or simply be substitutes only or pay as the best icon. The best icon is the Rabbit awarding 50x bet, Lamp 25, Key 12.5, Book 10 and the Card Deck 5x. There are 5 other card value symbols paying either 3 or 2x bet for a full line of five. With magic in the air, surely there must be a trick or two up these magicians' sleeves? You will have noticed highlighted positions in the centre of reels 1, 3 and 5 pretty much like Netent have on Magic Portals. 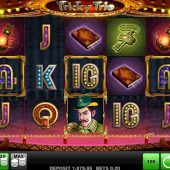 These 3 reels all contain a different magician and when they land in these illuminated windows they all award a short free spins feature with a special Wild trick. You can land just one or may get all three, the rounds will simply play out in order. Reel 1 The Incredible - 3 free spins with 2 or more random Wilds added each time. Reel 2 The Mysterious - 3 free spins with 2 reels randomly turned Wild each time. Reel 3 The Amazing - 3 free spins with a 2x2 block Wild added each time. No retriggers are possible in the free spins feature, which is a bit of a shame. 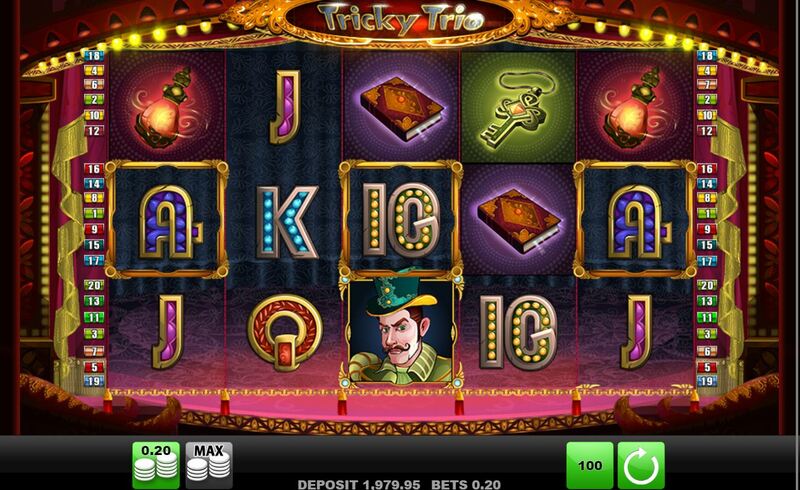 Tricky Trio slot tries to be clever but is quite simply unspectacular with regular, brief and poor bonus rounds. Sure, we get a decent 96.18% RTP and some pleasant symbols but the music is chronic and the general appearance dreary. Merkur aficionados tend to be high-volatility fans and you get the polar opposite here because despite some potentially decent pays possible the bonuses mostly pay 5-15x bet and that's usually with one or even two of the three spins having uselessly-placed Wilds. The only trick necessary here would be how to make this slot disappear - permanently.